Hey, have you eaten miso lately? Here’s the thing with me. Sometimes I buy an ingredient (like – example – Miso) for a specific recipe, and then it sits in my fridge long forgotten. That’s basically what happened with my miso. It was in the bottom drawer of my fridge, long after [whatever] recipe I bought it for was forgotten. Nathan wanted an Asian – ish stir-fry the other day, and I wanted broth-y soup, so we combined the two into a soup-with-stir-fry-on-top. When I was making the broth, I kept tasting it and it just needed something. Two big tablespoons of miso, and the broth was a perfect combination of spicy, salty, and a subtle hint of sweet. The next morning after we ate it I kept thinking about the miso, and the amazing flavor it had added. 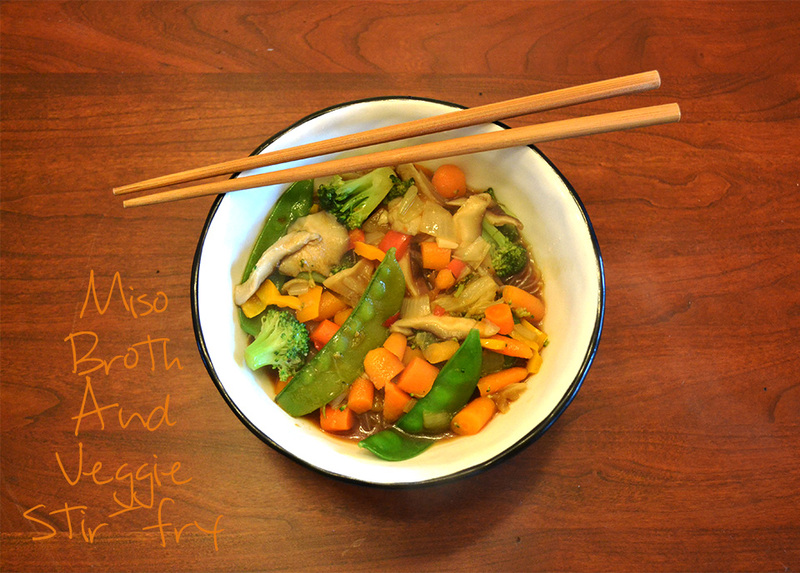 I began to wonder why I didn’t use miso more, and I started googling to learn more about it. Uhm. It turns out miso is incredibly healthy for you. You can read more about that here. I can see myself eating a lot more miso. Like. Today. The nice thing about this broth is that it’s a basic start. From here we added cellophane noodles and a huge serving of stir-fry. But, you could poor it over rice, or keep it simple by just adding green onions and kale for a broth-filled soup. (some cubed tofu would go excellent in it too, but we’re not super big tofu fans around here). The possibilities are endless. Even the stir-fry is up for customization. 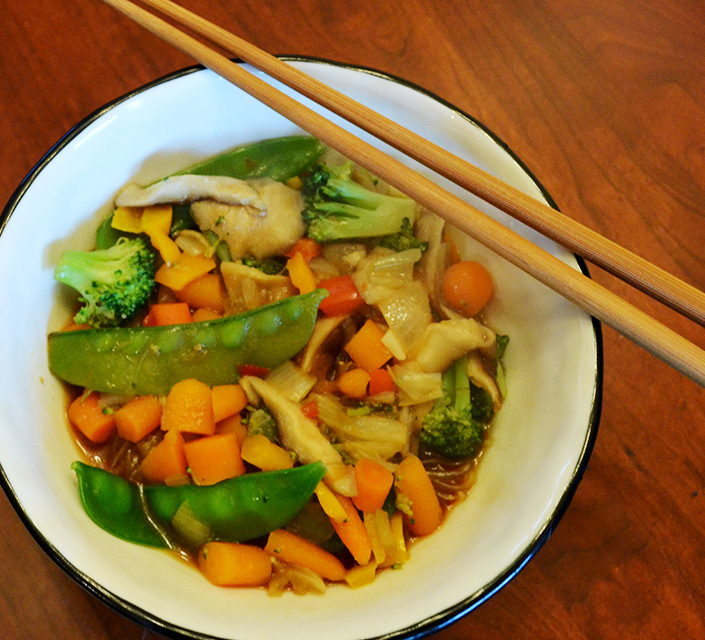 We stuck with some vegetables that were easy access in the store, but – really – you can stir-fry up anything. I am absolutely fascinated with Asian foods. I hope that my new found love of miso is a catalyst to explore more!